We have fine art painting originals, as well as limited edition fine art reproduction prints. You’ll find investment artworks painted in oil, watercolour, acrylic, charcoal, pastel or pencil. Limited editions can be printed for you on paper or canvas. Everyone is welcome to visit the gallery here in Bellbowrie, Brisbane. Please just give us a call on 3202 9991 before visiting. We’d love to see you here! 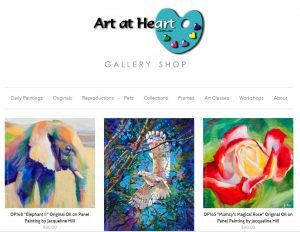 If you are after something that is a bit unusual, then you can commission an artwork that I will paint just for you – and you will be guaranteed to be happy with the end result – and no surprises! The size can be anything, from a tiny 5cm watercolour to a 6 sq m oil on linen Archibald Prize entry portrait, all the way through to a huge 50 sq m acrylic mural on a wall. I love to work with home and business owners who appreciate the value of fine art from a skilled and experienced artist, and are aware of the energy that changes in a room where a beautiful painting is introduced to the space. If you would like to purchase an artwork by making payments spread out over several months or even years, take a look at our Easy Payment Plan option. You will be surprised at how easy it is to do!